Hundreds of longleaf pine trees (Pinus palustris), scattered throughout the wooded Weymouth section of Southern Pines, NC, are marked with V-shaped cuts made by former slaves or their descendants to to let loose the flow of sap collected for turpentine, pitch, and rosin. This is America's oldest remaining forest of longleaf pines. Weymouth was formerly named Shaw's Ridge after the immigrant family who worked the forest with their slaves as a tar and turpentine plantation. 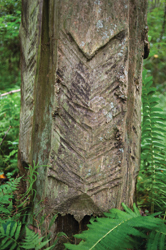 The "Bleeding Pines of Weymouth" are longleaf pine trees (Pinus palustris) marked with V-shaped cuts made by former slaves or their descendants, to let loose the flow of sap collected for turpentine, pitch and rosin. This viscous fluid bled down the trees into deep gashes, known as "boxes," that were carved into the base of the trunks. Hundreds of these trees remain in Weymouth Heights, composing an undocumented, yet significant Scottish-American/African-American cultural landscape dating from the second half of the 19th century. In 1904, Pennsylvania industrialist James Boyd purchased the land, making it part of his Country Place Era estate, Weymouth. At that time, the region was working to overcome the devastations of post-Civil War clear-cutting that, by the turn of the 20th century, had left a wasteland. Weymouth encompassed the region's last stand of original longleaf pine forest that once covered the southeastern coastal plain. Boyd called upon his nephew, landscape architect Alfred Yeomans, to develop his Weymouth estate and incorporate the trees into his plan. Yeomans' layout featured curving streets that wrapped around large wooded lots. As a result, many of the old-growth trees survive today scattered throughout the wooded Weymouth Heights section and in the adjacent Weymouth Woods Sandhills Nature Preserve. Spearheaded by Friends of Weymouth Landscape Committee (WLC), The North Carolina Chapter of The Nature Conservancy, Preservation North Carolina, The Sandhills Council of Garden Clubs, Sandhills Natural History Society, The Southern Pines Garden Club, Sustainable Sandhills and The Walthour-Moss Foundation, work to encourage a respect for and preservation of this unique living heritage has been ongoing. As a result of these efforts, the new 20-year comprehensive plan for the town includes sustaining this cultural landscape. The trees stand today as a reminder of the history of Southern Pines, from the days of slavery supported plantations to its current role as a recreational destination, and can continue to tell this story to future generations. 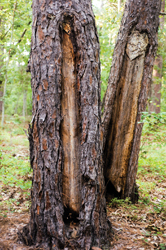 Over the past year, the turpentine trees in Southern Pines have been featured in national publications, including American Photo, Garden Design, American Forest, and USA Today. The longleaf pine ecosystem is considered endangered globally, with less than 3% of the original 93 million acres remaining. While tree preservation is encouraged in Southern Pines, there are no municipal ordinances governing the destruction of trees on private property. Threats to the site include fire suppression, logging and urban development. The lack of public awareness of the cultural and ecological value of the turpentine trees might be the biggest factor in determining their future survival.